Vacation Homes : These Are The Best Places To Own A Vacation Home In The U.S. These Are the Best Places to Own a Vacation Home in the U.S.
(Bloomberg) -- Aspen and Jackson Hole might be the first ski spots that come to mind when considering a vacation at a luxurious mountain resort. But if you’re actually looking to buy a home and care about convenience as well as luxury, then Utah’s Summit Park region may be the best option. Summit Park -- the term for the micropolitan area -- ranked highest on Bloomberg’s Wealthiest U.S. Vacation Havens Index. The area is home to Park City, Silver Summit and the Deer Valley resorts. Bloomberg looked for small pockets of wealth in more than 500 areas across four equally weighted metrics: vacation home stock, share of the workforce employed in real estate and recreation-related industries, home valuations and household income. The final index is comprised of 70 micropolitan statistical areas. A micropolitan statistical area includes one main urban center with a population of at least 10,000 but fewer than 50,000 people, at least one county and all designated hamlets, villages and townships. To access the full data set on the Bloomberg terminal, click HERE. In Summit County, the average sale price of a single-family home was close to $1.6 million in 2018, according to data from Sotheby’s International Realty. Within Summit County’s Park City limits, the average sale price was even higher at $2.7 million. "The Park City area offers a very wide range of home options, but increasingly moderately priced housing is being displaced as home prices are bid up in prime locations," said Bill Ligety, associate broker at Summit Sotheby’s International Realty and a 40-year Park City resident. Movie mogul Jeffrey Katzenberg sold his Deer Valley ski chalet for $11.6 million last year, the highest priced sale in the state. Two micro areas in Colorado -- Edwards and Breckenridge -- landed at No. 2 and No. 3, respectively. Ski resorts in those areas include Vail, Breckenridge, Copper, Beaver Creek and Keystone. In both areas, at least 30 percent of those employed were involved in real estate sales, leasing or providing services and entertainment. The micro area in and around Jackson Hole was ranked No. 4. In Jackson, Wyoming-Idaho, an area joined by the two counties across the state line, one in five homes cost $1 million or more. 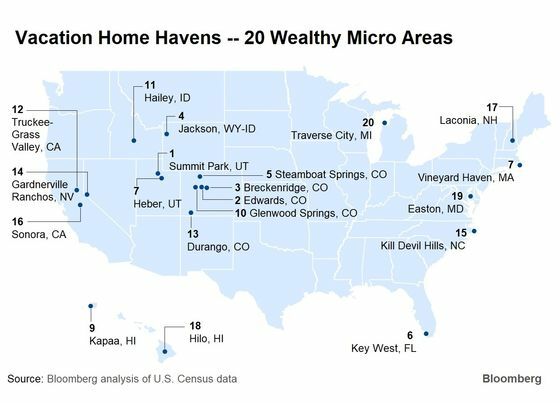 Wealth is further concentrated in Teton Village -- an enclave at the foot of the Jackson Hole Mountain Resort -- where an average income of $515,000 placed it on Bloomberg’s Richest Zip Code list. While mountain resorts took the top five places on the Bloomberg index, popular beach locations claimed three of the next five spots. Key West, Florida is the top ranked beach haven on the list. The next highest ranked seaside resort areas are Vineyard Haven, Massachusetts and Kapaa, Hawaii, otherwise known as Martha’s Vineyard and Kauai Island, respectively. 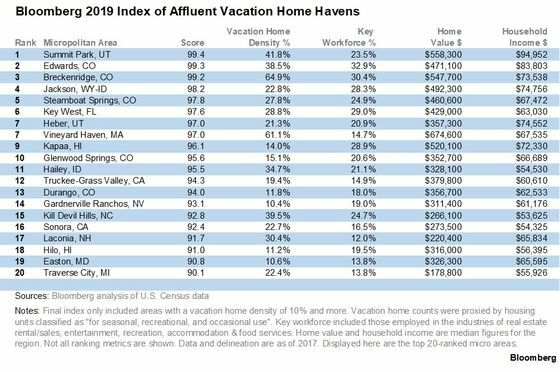 The median home value was highest in Vineyard Haven at $674,000, with 60 percent of properties there considered vacation homes. Chilmark, a tony town 16 minutes away from the region’s airport, boasts median home values of more than $1 million, according to current listings on the e-commerce real estate site Zillow.com. Nine areas in the Great Lakes region made the overall list, including Traverse City, Michigan at No. 20. It follows Easton, Maryland, on the eastern shore of the Chesapeake Bay, where many wealthy residents from Washington and Baltimore -- about an hour and a half drive away -- own property. A landlocked area in Texas grabbed the 51st spot on the list. What makes Mineral Wells, Texas in Palo Pinto County popular is access to Possum Kingdom Lake and its state park. Many home buyers in the area are looking for a second or third vacation home with 70 percent of vacant units categorized for seasonal and recreational use. Real estate in the area has boomed following a surge in rebuilding in the aftermath of a 2011 wildfire. Another three areas in New Mexico and two in Arizona represent the southwest region in the index. Note: Many popular vacation destinations are not included in a "micropolitan statistical area," rather they are located within larger metropolitan statistical areas.